Jumeirah Group, the Dubai-based luxury hospitality company, was out in force at Arabian Travel Market, as it prepares to open the highly-anticipated Jumeirah at Etihad Towers, Abu Dhabi in just a few months. 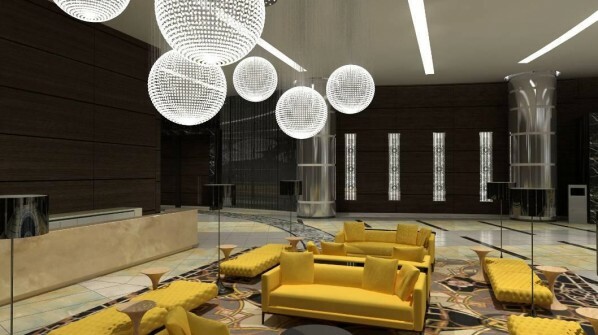 Scheduled to open in September 2011, Jumeirah at Etihad Towers, Abu Dhabi will represent the Dubai-based group’s first venture into the capital of the United Arab Emirates. The property is located on the shores of the Arabian Gulf along Abu Dhabi’s Corniche, 37km from Abu Dhabi International Airport. Jumeirah at Etihad Towers was developed under the patronage of His Highness Sheikh Suroor bin Mohammed Al Nahyan’s Projects Department with architects DBI Australia starting work on this unique project in January 2006. The iconic beachfront project will feature five towers, including a 280m luxury hotel (Jumeirah at Etihad Towers), a prestigious office tower with 46,000m² of leasable office space and an observation deck, and three towers housing 897 apartments. 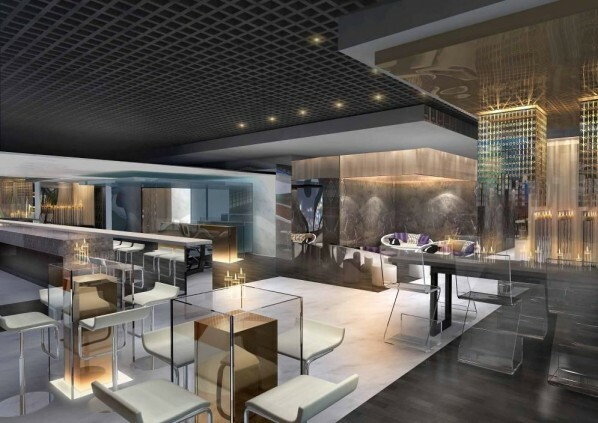 The connecting four-level Podium will feature contemporary restaurants and 30 premium boutiques. Level 2 and 3 of the podium, are connected to the heart of the hotel; home to a sophisticated lobby bar and the Grand Lobby that features panoramic sea views. Jumeirah at Etihad Towers is made up of 396 guest rooms and suites, 199 serviced residences and 13 restaurants, bars and lounges. The hotel also offers a 130m private beach, a Talise spa, pool, health club and extensive conference centre with 13 meeting rooms and a grand ballroom. The dramatic sculptural forms of the towers compliment the sophisticated and contemporary interior design, with a cultural edge. Art works from His Highness’ private collection provide a local Arabian touch in public areas and conference pre-function areas. Jumeirah at Etihad Towers has 66 floors with 396 beautifully appointed guest rooms & suites, each with warm contemporary décor and furnishings. All rooms and suites offer stunning sea views and range from 40m² to 60m² in floor area with the latest fully integrated lifestyle technology. Level 60 is the Royal Etihad Suite which spans 980m² and features four bedrooms and two Majlis areas, with Butler service, as well as exclusive pieces of fine art and a specially-designed grand piano. The exclusive Club Lounge is located on Level 45 and provides complimentary meals and drinks service throughout the day, as well an internet lounge, shower suites, and a business centre with four meeting rooms. Club Executive privileges can be booked with any room type and include access to the Club Lounge. The 199 fully serviced residences vary from studios of 57m² to spacious one, two and three bedroom apartments of up to 170m². All inspirationally designed residences offer irresistible sea views and share an exclusive reception area. Jumeirah at Etihad Towers offers a choice of 13 restaurants, bars and lounges with a variety of diverse culinary options. The collection of sea view restaurants on The Podium include a chic Lebanese restaurant and a luxurious all day dining restaurant, both with outdoor terrace seating, a classic French brasserie, a stylish Japanese restaurant and lounge, and a casual beach restaurant. The pool bars on the outdoor pool terrace offer a selection of juices, smoothies and other drinks as well as a menu of light bites and snacks. The hotel offers a beach-inspired casual restaurant in addition to Scott’s Seafood Restaurant, which is located on the water off the beach. A lavishly appointed bar is located on Level 62. The exquisite pan-Asian restaurant of the hotel is housed on Level 63. Both levels have stunning views of the Corniche and the Abu Dhabi cityscape; offering guests a sophisticated dining experience with views to match. Guests can also relax and indulge in the hotel’s Lobby Lounge and bar. Extensive conference & banqueting facilities are provided through the hotel’s purpose built Conference Centre, located on Podium Level 4. 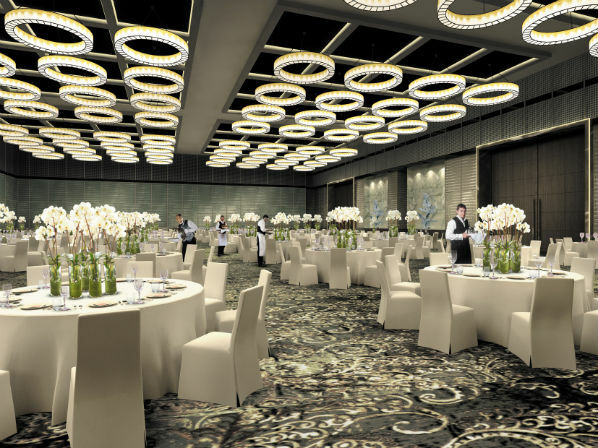 The Conference Centre is among the largest in Abu Dhabi and features 13 meeting rooms and a stunning ballroom. The ballroom can comfortably accommodate up to 1,400 guests for a conference or 1000 guests for dinner, and can be divided into four separate sections. The centre also offers spacious pre-function areas as well as a green room and business centre facilities. One of the more unique designs has provided a service elevator to the ballroom with the capacity to lift cars. The Talise Spa at Jumeirah at Etihad Towers is located on Podium Level 3M and is comprised of 14 private treatment suites, a hammam and a Rasoul chamber (a traditional Middle Eastern cleansing and exfoliation treatment, using mud, steam and oil). Jumeirah at Etihad Towers offers a health club with state of the art TechnoGym equipment on Podium Level 3M, next to Talise Spa as well as a 130m private beach. For guests looking for lower impact recreation, a landscaped oasis of pools and gardens provide a tranquil space. The hotel also houses a selection of high end shopping with over 30 premium boutiques located in the hotel. Jumeirah Group, the Dubai-based luxury hospitality company and a member of Dubai Holding, operates a world-class portfolio of hotels and resorts. Jumeirah Hotels & Resorts includes Burj Al Arab, voted “World’s Leading Hotel” and “World’s Leading Presidential Suite” at 2010 World Travel Awards. Other iconic properties include Jumeirah Beach Hotel, Jumeirah Emirates Towers, Madinat Jumeirah, and Jumeirah Zabeel Saray; Jumeirah Carlton Tower and Jumeirah Lowndes Hotel in London; and Jumeirah Essex House in New York. Jumeirah Group also runs the luxury serviced residences brand Jumeirah Living; the spa brand Talise; Jumeirah Restaurants; Wild Wadi Waterpark; The Emirates Academy of Hospitality. I want to apply as a Team Leader Front desk. If possible to ask the direct email so I can send my CV. Waiting for your response. Thank you.